Power Manager 4 introduced a new feature called Scattering. Scattering allows you to create events that avoid overloading your servers and infrastructure. Having all your Macs automatically powering down at night and powering on in the morning is a great way to save energy. You can schedule your lab of Macs to look after themselves at night and be assured your Macs will be on and ready for use each morning. However, scheduling your Macs to power on at exactly the same time can cause an undesirable burden on the network and supporting servers. This burden can be avoided by deploying slightly different energy saving schedules to groups of Macs, but this adds an unwelcome degree complexity. How can you deploy a single energy saving schedule to a large number of Macs, while avoiding all the Macs triggering events at exactly the same time? Power Manager solves this problem with Scattering. Scattering lets you modify your triggers to perform within a time span, rather than at a specific time. Consider an event set to power on your Macs at 7am. 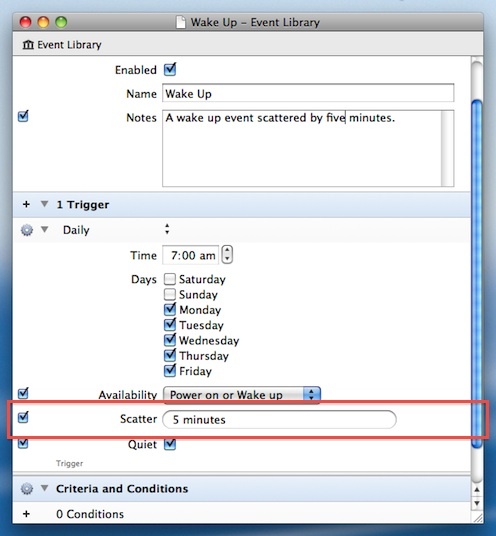 By adding a five minute scatter to the event's trigger, Power Manager will randomly distribute the event within a window from 6:55am and 7:05am - five minutes either side of the trigger time. Macs will start powering on no earlier than 6:55am, and by 7:05am all of your Macs will have powered on. This scattering behaviour lets you spread out when an event occurs, while maintaining a single schedule for all your computers. Power Manager handles the scattering of events seamlessly. Scripts and tools will only see the original energy saving schedule. You can compare two different Macs running a scattered event, and their schedules will be identical. Even though both Macs will perform the scattered event at slightly different times. What does this mean for you running a Mac lab? It means you can deploy a single Mac image across your network with a single energy saving schedule, and still be able to scatter events to avoid overloading your network. It means you can create energy saving schedules that alleviate the peak load burden on your servers and infrastructure. If means you can write scripts and tools that compare schedules, events, and triggers without needing to adjust for scattering. The scatter field is an optional field within Power Manager's date and time based triggers. Triggers supporting scatter include trigger once and trigger daily. You can scatter a trigger between 60 seconds and 12 hours either side of a specific time. You can create scattered triggers in Power Manager Professional. This article was posted in Design, Energy saving, PM4, PMPRO4, and Power Manager and tagged dssw, Power Manager, Professional, and scatter.